This antique silver plated sugar and creamer set, made sometime around the turn of the twentieth century, is etched with butterflies and flowers. They are not an exact set but were used together by the original owner and are a great match. The silver sugar bowl was made by Jennings Bros. from Bridgeport, CT and is marked quadruple plate and 251. The silver creamer was made by C.E. Barker Mfg. Co. in New York City and is marked quadruple plate. This set would look lovely on your dining room table or on a shelf in your farmhouse kitchen next to the white pottery. 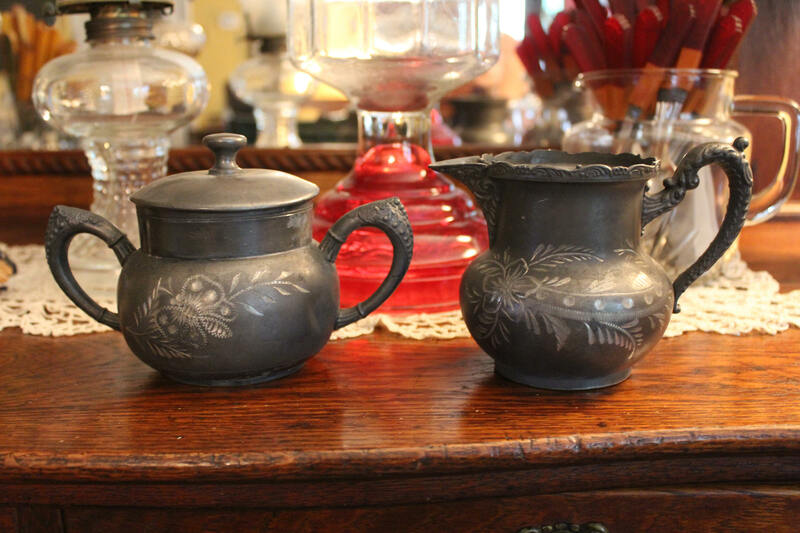 This Victorian silver sugar and creamer is in great antique condition. There is lots of beautiful patina darkening it to a charcoal grey. There is tarnish and some minor dents and signs of age. Please use your zoom for a good look. The sugar bowl is 4 1/4" high, about 7" handle to handle, with a mouth diameter of 3 1/4". The creamer is 4" high with a mouth diameter 3 1/8".